Happy Autumn Equinox, everyone! I hope you are having a rad time enjoying the change of the seasons. This lady is in her PJs on the couch with warm tea and cold and flu tablets. Boo! But on the plus side, I get some time to share with you my new top. It’s got polka dots AND there is a ruffle. Who can say no to that? 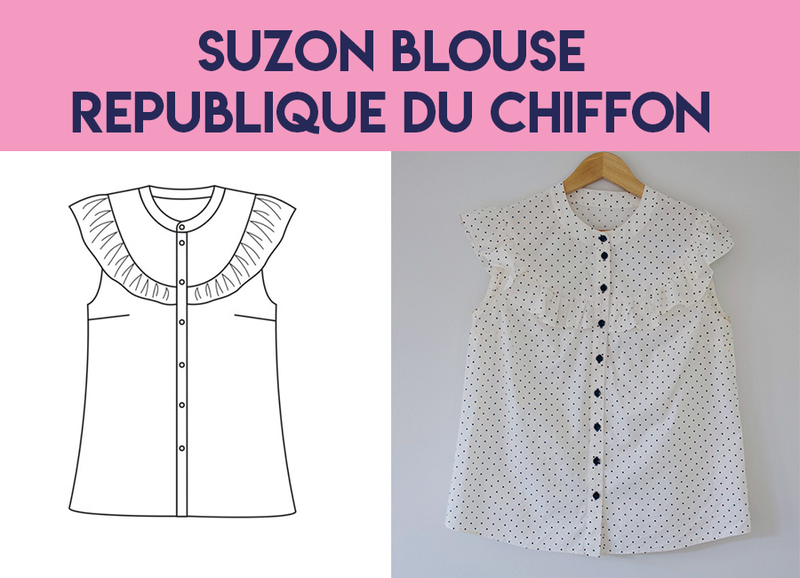 This sassy number is the Suzon Blouse by Republique du Chiffon. The Suzon is a sleeveless, button-up shirt with a ruffle following the natural curve of the shoulder. This pattern comes only in a paper version so for those of you on Team PDF you have been warned. Also, Past Amanda would like to provide a heads up to everyone who traces things out that the Suzon requires a seam allowance to be added. GAH! Learn from my mistakes, peeps. I’ll be real here- I totally made this top out of the wrong fabric even though it is one of my faves. The fabric is a Pin Spot poplin from Spotlight which I buy in bulk when it is on 40% off. It is easy to sew with, presses nicely and has a bit too much of a firm hand for what I was intending. Oh well, they can’t all be winners! Note to Future Amanda: don’t do what Past Amanda did and be so desperate to make a pattern that you can’t be bothered driving the 40 minutes to purchase fabric that will actually suit. You’ll just get cranky at yourself later and eat half a packet of Tim Tams while you sulk. 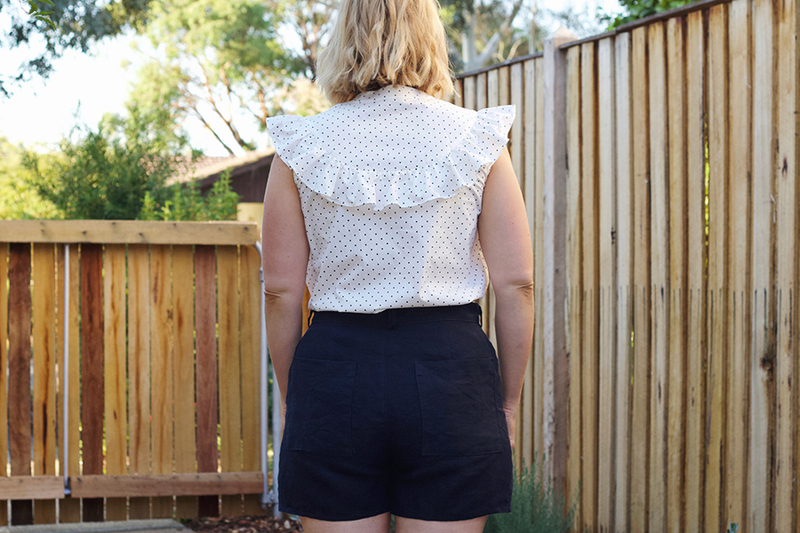 Though the Tim Tams were a good idea…And as a small side note: I have been using this poplin as a lining and accent for most of my sewn projects for the last 6-ish years and I love the cohesive feel it has brought to my me-made wardrobe. It is such a small thing but brings me lots of joy! Alterations wise, I made a 46 in this which proved to be a too big when it came time for the final reveal. The armholes were gaping a lot and there was lots of ease around the bust. These issues combined with the poor fabric choice made for a crazy tent top which I was not digging. In the end I took 4cm off each side which felt good at the time (thanks cold and flu tablets!) but in hindsight is way too much. As a result I now have draglines of sadness and the back is too tight. Dang it. I need to work on the fit some more – most likely a broad upper back adjustment and an FBA on the size down. Ruffles for days! I think that 20-greateen is actually Amanda’s Year of the Ruffle! The sleeveless button-up vibe. 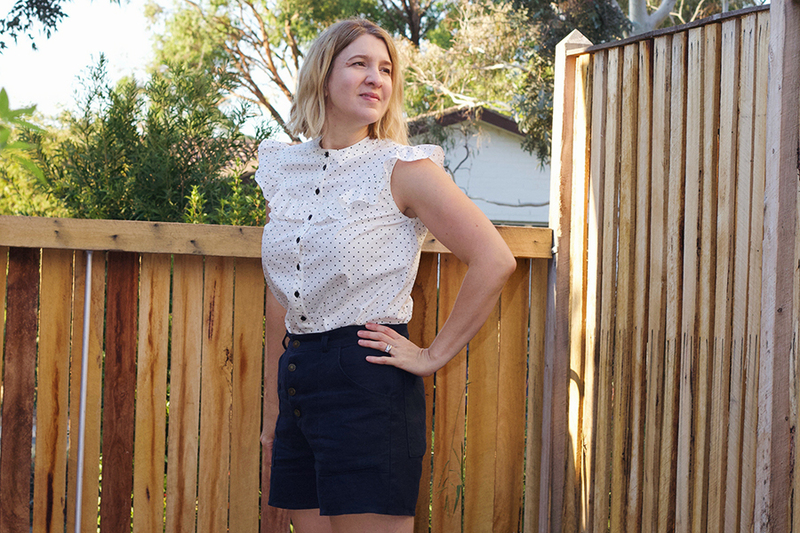 As a lady who loathes sleeves, especially in woven tops, having a button up drafted specifically sleeveless makes me very happy. Use the right fabric. I have some sweet Liberty lawn that has been maturing in my stash waiting for this pattern. Alterations: removed 4cm from each side seam at the bust grading to nothing at the hips. Future Amanda remaking this pattern – please remember this was too much!!! Overall, I seriously dig the style of this top if not my actual finished piece. Whilst I’ve worn this number to work a few times (and gotten a heap of ruffle compliments) the poplin and fit issues has made it feel a bit meh to wear. I’m looking forward to having another go at this in a better suited fabric. Here is to future victories! I’m glad you are still wearing it because it is very cute! The black buttons look awesome. Just imagine your next one will be perfect! You can call this your practice run! I do practice runs all the time – some people call them voiles or muslins but I favour “practice run” since I play around a lot with fit, seaming ideas, fantasizing about the right ultimate fabric choice, embellishments – I wouldn’t consider a project without this essential step in the process. For a practice run I think your blouse is very pretty! Thank you! Practise runs are totally what all the rad ladies are doing! Bwahahaha, love the black marker on the buttonholes! Total macgyver solution! This is cute, hope you find a softer fabric that also has black spots because the pattern/design combo is ace! But it actually looks really amaze-balls in the pics, I’m struggling to see the issues you talk of! Then again, photo selection does count… 😉 This fabric really does suit you to a tee (and the top, too!) so I can totally get why you went straight for it! I’m looking forward to seeing you make this up again, regardless – it’s such a fun pattern! Do you mean there are some people who wouldn’t have used a marker?!? I love it. I too am struggling to see the fit issues, but considering I’d be black-markering the buttonholes too, I totally accept they’re there and annoying you. I adore those spots and stripes poplin too. It’s got such a lovely crisp hand and – polkadots!